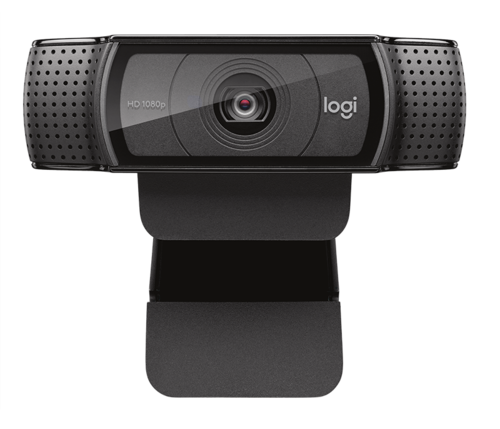 Creating that all-important first impression has just been made easier with the Logitech C920 Pro HD Webcam. With it's crisp HD video and crystal clear sound, this HD Pro webcam is the perfect tool for Skype calling and creating polished online video content. The Logitech Pro offers superb video recording capability, with full HD video and dual microphones. A five element Carl Zeiss glass lens, along with automatic HD light correction, ensures great video quality every time. There are two microphones, fitted on either side of the camera. This allows for capturing stereo sound from every angle, ensuring that you always sound clear and natural. In addition to superb quality video, this webcam also captures 15 megapixel high resolution still photographs. The C920 Prp HD Webcam makes high quality internet calls every time, with 1080P video calling at 30 frames per second. The premium autofocus and automatic light correction provide consistently high definition images, even in low light conditions. The Logitech HD Pro also boasts one-click uploading to the internet. With this feature you can share your high quality recorded content quickly and easily. The Logitech C920 Pro has an excellent video quality and a superb sound. This will no doubt add professionalism to all your video and online content.